← Winter Cold or Winter Allergies? The relationship of telomere length to cellular aging is a popular subject these days but what are telomeres exactly and how do they affect our longevity and wellbeing? Telomeres are repeated sequences of DNA found on the ends of DNA strands. They help protect our DNA from getting shorter during cell division and provide protection from damage that inevitably leads to cellular death and loss of health. Telomeres are described as the protective caps found on the ends of our chromosomes that enable cells to divide without losing genes. As a cell can normally divide 50 – 70 times during its lifetime, without these protective ends chromosomes could malfunction and corrupt the cell’s genetic makeup. Telomere length is now considered a marker for cellular aging. Telomeres progressively shorten over time and eventually cells cease to divide, resulting in age-related degeneration of organs and tissues. Short telomeres impair the ability of cells to properly divide, negatively affecting DNA replication, upsetting healthy physiological balance in the body and contributing to the aging process. Short telomere length is associated with cardiovascular disease, diabetes, cancer, osteoporosis, dementia, inflammatory diseases and a shorter lifespan. Certain cells produce an enzyme called telomerase, which adds bases to ends of young cells to keep them from wearing down too quickly. In time, with repeated cell division, there is not enough telomerase to prevent the shortening of telomeres. To put this in perspective, white blood cells in newborns contain about 8,000 base pairs, or chains of chemical code, that determine the length of their telomeres. In those same cells, adults would have about 3,000 base pairs and the elderly only 1,500. Every time a cell divides, it can lose 30 – 200 base pairs from the ends of its telomeres. What’s the good news? Longer telomere length is linked to healthy aging and overall longevity. It appears that telomeres can be influenced by non-genetic, healthy lifestyle factors. 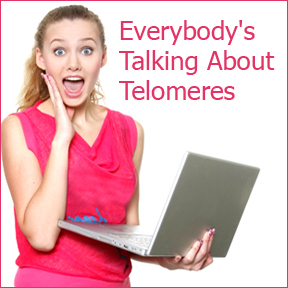 Based on studies it appears that certain lifestyle habits may help maintain or possibly lengthen telomeres. Improve your nutrition by following a healthy eating pattern such as the Mediterranean diet. Long touted for its health promoting benefits, a recent study published in the British Medical Journal (BMJ) showed that adherence to the Mediterranean diet was associated with longer telomere length, a biomarker of aging. Fruits, vegetables and nuts, key components of the Mediterranean diet, are known for their antioxidant, and anti-inflammatory properties that influence telomere length, the health of your DNA and your genetic material. If you have yet to start exercising regularly, you may be shortening your lifespan. There’s good reason to participate in vigorous exercise that elevates your heart rate or induces sweating 4 to 5 times each week. To improve your metabolism, maintain a healthy weight. If you are overweight, try to reduce both your weight and your waist circumference. Enhance your wellbeing by reducing stress. Daily meditation accompanied by mindful breathing helps you to tune into your body and be present in the moment, all helpful for stress reduction. Stress reduction can contribute to increased feelings of personal control and help reduce depression. Nutrients that play a role in supporting, protecting and possibly increasing telomere length include vitamins D, C, E, and B12, omega-3 fatty acids, turmeric and antioxidants such as resveratrol and astaxanthin. Resveratrol (200244) by Douglas Laboratories – As a powerful antioxidant, Resveratrol aids in supporting normal cardiovascular and mitochondrial function. It supports the normal aging process by protecting and supporting telomere elongation and cellular longevity. Gluten, soy, dairy and yeast free formula. Astaxanthin 4 mg by Pure Encapsulations – Derived from Hawaiian microalgae, this potent antioxidant supports skin, macula, joints, immune, cardiovascular and overall health. Gluten and soy free. Meriva- SR Curcumin Phytosome by Thorne Research – This formula provides highly bioavailable, effective antioxidants to help maintain a normal inflammatory response and support joint and cardiovascular health. Gluten, dairy and yeast free, Non-GMO formula. D3 5000 by Metagenics – These easy to swallow soft gels support immune, bone, neurological and cardiovascular health with a highly bioavailable form of high potency vitamin D3 as cholecalciferol. Gluten free, Non-GMO formula. This entry was posted in Home and tagged Astaxanthin 4 mg by Pure Encapsulations, D3 5000 by Metagenics, Meriva-SR Curcumin Phytosome by Thorne Research, Professional Supplement Center, Resveratrol (200244) by Douglas Laboratories, Telomeres, Vitamins and supplements, www.professionalsupplementcenter.com. Bookmark the permalink.